A third incident involving the arrest of a Chinese fisherman by Indonesian authorities operating near Natuna Island – this time leading to an injury of one Chinese fisherman – has ratcheted up tensions between Beijing and Jakarta. The June incident featured the second recent occurrence — the other one occurring in May — of the Indonesian Navy opening fire to force Chinese fishing vessels to comply with Indonesian demands to cease operations and allow Indonesian authorities to detain the vessel. This is of course not the first time the Indonesian Navy has been involved in use of force against foreign fishing vessels operating in Indonesian exclusive economic zone waters. On September 19, 2005, the Indonesian Navy pursued and arrested the Chinese fishing vessel “Fu Yuan Yu 132” that was illegally fishing off Papua Province. During the operation, the naval vessel opened fired against the fishing boat, killing one and injuring two Chinese crew members. 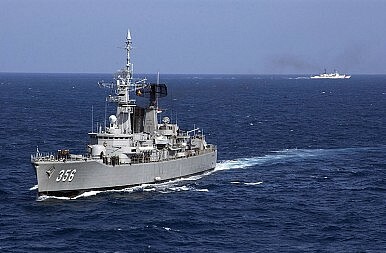 Yet the June incident is notable because it marked the second instance of the Indonesian Navy taking the lead in patrolling the Natuna EEZ to combat increasing incursions by Chinese fisherman – an area that had previously been patrolled primarily by Indonesian maritime law enforcement vessels. The recent deployment of Indonesia’s Navy to Natuna appeared to replace, to some extent, the Ministry of Marine Affairs and Fisheries (MMAF) vessels that had been protecting Natuna waters from foreign fishing violations, in particular after a Chinese coast guard vessel provocatively rammed and forced free a Chinese fishing boat that was being towed back to Natuna under the protection of the MMAF in March 2016. Soon after that incident, the Indonesian Navy was tabbed by Indonesian policymakers to patrol Natuna, presumably as a more forceful deterrent against the Chinese. In contrast to the March incident, in the May incident – the first major confrontation between the Indonesian navy and Chinese fishing vessels near Natuna in several years – the Chinese coast guard on the scene appeared not to interfere with the operation of the Indonesian Navy as it arrested a Chinese fishing trawler and later towed it back to Natuna. [A]t the time, the pursuit [of the fishing vessels] involved a tiny patrol boat belonging to the KKP [the Ministry of Maritime Affairs and Fisheries]. But this time [the Chinese coastguard vessel] did not dare to interrupt because the chase involved a frigate. This statement gives voice to a perception among some policymakers in Southeast Asia that navies are more effective deterrents than coast guards in combating illegal maritime activity. It also highlights an important and under-analyzed tension in the region over whether navies or coast guards offer more appropriate platforms for carrying out policing functions at sea, especially as it relates to countering the aggressive behavior of China’s fisherman and coast guard. Until recently, the notion that states in Southeast Asia should employ coast guards as opposed to navies to manage, regulate, and enforce domestic and international maritime laws and conventions had been gaining currency. Coast guards, for one, present a less escalatory face of state power than navies. Their status as a civilian maritime law enforcement agency signals an intent on the part of the state to enforce activities that may impact the maritime environment, safety, and protection of marine resources of a coastal state. Finally, coast guards offer a wider array of non-lethal means of enforcement that dampen the potential for inadvertent escalation to war in disputed territory, in particular in the South China Sea. The trend toward greater utilization of coast guards as front line defenders of maritime rights and interests has been on display not only in Indonesia, but also in the Philippines, Malaysia and Vietnam over the last five years. The coast guard fleets of most countries in Southeast Asia, however, lack sufficient capacity to adequately deal with the formidable maritime threats along their coast and in disputed waters in the South China Sea. Navies are often viewed as the preferred asset for far seas enforcement because of their capacity to operate at long range from shore facilities. Also, most naval officials in the region strongly promote the view that navies offer a more effective deterrent than their civilian maritime law enforcement counterparts. Navies, like all bureaucratic actors seek relevance and funding, and thus most seek status as the vanguard of a nation capable of safeguarding all forms of threats in the maritime domain. Yet navies are generally ill-suited for many lower-end contingencies, such as counter-IUU (illegal, unreported, and unregulated) missions. The platforms, personnel, use of force doctrine, and basis in domestic and international law of navies are sufficiently distinct from coast guards as to be inappropriate to meet the wide array of law enforcement duties required by modern maritime states. Navy platforms and personnel are tailored for military campaigns and equipped for high-kinetic environments not always appropriate for civilian law enforcement patrols. To deploy a warship to arrest fishermen, for example, may unnecessarily convey lethality and intimidation. This dynamic is exacerbated when navies attempt to employ firepower to disable non-compliant vessels leading to causalities, or when navies stumble into crises involving civilian or government actors in territorial disputes. Regardless of the domestic policing function of the naval asset itself, both scenarios present the potentially problematic optics of a warship employing lethal force against unarmed or civilian actors. Despite these factors, as we learned recently from the case of Indonesia, the deterrent effect of navies combating illegal foreign fishing activities continues to offer compelling rationale for policymakers in the region to deploy navies on the front lines of counter-IUU operations in disputed waters. Lyle J. Morris is a Senior Project Associate at the RAND Corporation. Indonesia is set to follow a passive and dependent policy in the region.